After reviewing the judges' feedback from my homebrewing competition entries earlier this year, and combining it with my own observations, it's clear that for some styles I am not quite hitting my target for mouthfeel and (where appropriate) sweetness. Add unfermentable sugars: This can be done with sugars like lactose, which yeast won't ferment. This will add a sweetness to a beer like a milk stout. I've done this in the Stout Chocula beer I brewed earlier this year to good effect. However, I don't see lactose working well in a Belgian beer. Add Calcium Chloride: This can reportedly enhance the maltiness of a beer. This is something I haven't tried, but will tinker with in the future. Increase Caramel Malt: Increasing the amount of caramel (a.k.a. Crystal) malt in a beer can increase residual sweetness, though if you go beyond 1-2 pounds in a 5-gallon batch you can oversweeten the beer. I've done a little of this, but could probably do more. Change the yeast strain: Switching to a comparable but less-attenuative yeast strain can result in more residual sugar in the beer, leading to additional sweetness and body. This is something I have considered but haven't tried yet. Boil longer: A longer boil generates more of a Maillard reaction in the beer and will increase the bready, toasty flavor of the beer. A very intense boil will produce sweeter caramel flavors. I will look into this for future beers. Mash at a higher temperature: Mashing in the 152-160F range will result in more long-chain sugars in the beer that yeast cannot ferment. This will increase body and residual sweetness. I've played with this a bit, but have not yet seen significant results from it. I may need to combine the technique with others above, such as increasing caramel malt amounts and adding calcium chloride. 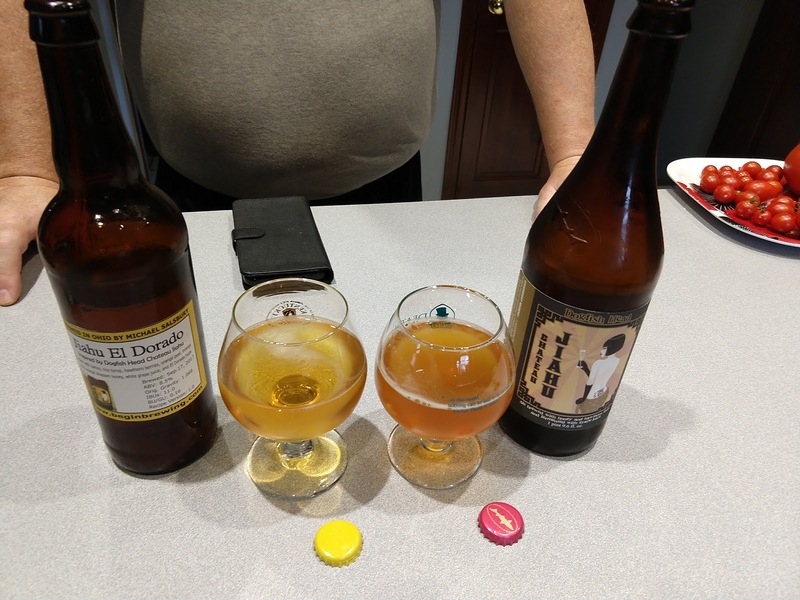 While most of my beers have turned out fine, my "bigger" Belgian beers and my Scottish ale both tend to ferment a little dry and thin for my taste (and the judges' also). I'm hoping that leveraging this information will get me a better beer in the future. 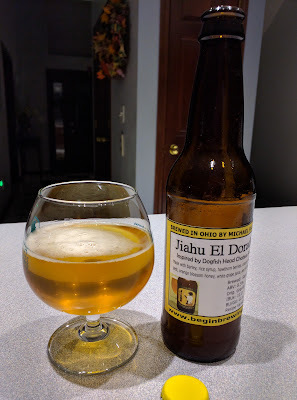 As I mentioned in yesterday's post on brewing a Ta Henket clone, another of my most-favorite Dogfish brews is Chateau Jiahu. This beer is loosely based on an ancient recipe for beer from China, uncovered by Dr. Patrick McGovern and published in his book Ancient Ales: Rediscovered and Re-Created. I bought the ingredients I needed, thinking that I had some Simcoe hops around from a previous brew (but didn't). When it came down to brew day, I discovered that there were three things I couldn't readily get my hands on at the time: sake yeast, white grape concentrate, and Simcoe hops. I thought I had Simcoe in my freezer, but didn't. I did have some El Dorado hops, which aren't a recognized substitute for Simcoe but sound like they might be interesting in this beer. I didn't have another use planned for them, so they made the ingredient list. White grape juice concentrate was something I'd seen in local groceries in years past, but could not find in the days leading up to brew day. Research suggested that the muscat grape concentrate and the Welch's variety were both roughly 3 times stronger than natural juice. So instead of the 16 ounces of concentrate, I decided I would use 64 ounces of off-the-shelf organic white grape juice instead. This should provide the same amount of grape flavor that the concentrate would have, and presumably the same amount of fermentables. I probably could have gotten sake yeast by mail order. But I watched the old TV series Brew Masters where we see the Dogfish Head experts having to dump an entire batch of Chateau Jiahu because the sake yeast just wouldn't cooperate. I decided to use the book's recommended alternative of Lallemand Abbaye Yeast instead. I like Belgian yeasts anyway, and this might (to me) improve the aroma and flavor of the beer. In the end, in order to get the original gravity where I wanted it after adding the honey and grape juice, I needed to add approximately 3 quarts of water. This yielded 6.0 gallons in the fermenter at the intended original gravity of 16.6 Brix or 1.068 SG. I began by putting 5 gallons of water in my Grainfather kettle and dropping in a Campden Tablet to remove any chlorine or chloramine in the water. 45 minutes: Removed some wort, covering Hawthorn Berries with it and ran an immersion blender through it to puree the berries. The immersion blender had trouble with the berries as they are very dry and dense. If I do this recipe again, I'll use a full-size kitchen blender and maybe soak the berries in boiling water for a while instead of waiting to use wort. The beer was one of the nicest-smelling brews I've ever smelled coming out of the kettle. The beer was pumped into the fermenter and topped off with cold water to reach the desired original gravity. The Abbaye yeast was pitched dry onto the wort, since this method has served me well in the past. The fermenter was left to ferment naturally with no temperature control. On October 7, 2017, I added 6.25 ounces of corn sugar to boiling water to prime the beer for bottling. The beer was transferred from its fermenter into the bottling bucket atop this priming sugar. The gravity transfer ensured that the beer swirled and mixed in the sugar as it transferred. Since my main temperature-controlled bottle conditioning setup is busy trying to carbonate the Palo Santo Marron clone, I put as much of this batch as I could fit into a plastic storage bin with a fermwrap heater to serve as a secondary conditioning chamber. The beer will spend two weeks in this container at 76F, after which I'll move the rest of the batch into the bin for a week. I'm expecting to be able to do a taste test around October 22. I'll be back to update this page then. I thought it would be useful to compare the clone beer to the real thing. Fortunately, I had a bottle of Chateau Jiahu in the fridge that I could compare with my version. A friend of mine, in the background of the above photo, volunteered to lend his expert palate to the task of comparing my "Jiahu El Dorado" to real Dogfish Head Chateau Jiahu. We agreed that strictly as a clone of the real Chateau Jiahu, the beer was a failure. The real beer is darker, as you can see above. The real beer has a slightly hoppy aroma to it that the clone does not. The flavor of the two beers is similar, but the clone lacks the pine and resin notes in the real Chateau Jiahu. The citrus comes through more in the clone than in the real beer. The grape notes in the real beer are more like ripe fruit, while those in the clone are slightly tart. If I was trying to adjust this recipe to get closer to the real Chateau Jiahu, I would incorporate some caramel malt as a steeping grain in the next version. I would use the Simcoe hops the recipe called for rather than the El Dorado hops I used. I think those simple changes might bring the two beers closer together. Having said that, my friend and I also agreed that while Jiahu El Dorado might not be enough like the Dogfish Head brew to be considered a clone, we actually preferred it to the real beer. The pine and resin notes in the Dogfish Brew seemed to conflict with the fruit backdrop, and seemed harsher than the hops notes in the clone. I think using El Dorado hops (while a last-minute substitution) made the beer better than if I had used the Simcoe hops the recipe called for. The addition of clementine zest at flameout also seemed to add something to the beer. In the end, while we liked both beers, we felt the clone was the better of the two. That was a conclusion I did not expect at the start of the taste test. In the brewing, the hawthorn berry puree was the biggest nuisance. The dried berries are very, very tough and hard to break up with a hand blender. Next time, I would probably use boiling water and a full-size blender. I would also let the berries soak overnight in the boiling water in a sealed container to give them a chance to rehydrate better. That might (or might not) improve the flavor of the beer. I was impatient to try the beer, so I opened a bottle after only a week of bottle conditioning. That's the one in the picture at the top of this post. It had a nice level of carbonation. When first poured into the glass, it had a thin and very active head on it. This dissipated so rapidly that it was gone by the time I photographed it. Rehydrate the Hawthorn Berries in boiling water overnight before blending and incorporating into the beer. They seemed incredibly dry and hard, making me wonder if they provided as much flavor as they could have. Despite that seemingly large number of potential changes, the as-is recipe above is actually quite good, very smooth, and very easy to drink. If I made no changes at all, I'd still be happy with it. In early August, my wife and I visited Dogfish Head's brewery in Milton, Delaware. We took their tour, which was interesting and informative, and enjoyed a few samples at the taproom afterward. The whole visit inspired me to think about brewing, and specifically about brewing clones of some of my favorite Dogfish Head beers. If you asked most folks which Dogfish Head beer was their favorite, they would probably mention 120-Minute IPA (or 90-Minute or 60-Minute), or World Wide Stout, or maybe one of their others. The ones I really enjoy most from Dogfish Head are the Ancient Ales series. Of those, Ta Henket is probably my favorite. Judging from the fact that they appear to have stopped making it (according to a book I'll mention in a moment), perhaps I'm one of the few "off-centered people" who liked it. Ta Henket impressed me with its Ancient Egyptian pedigree, its unusual spicy and herbal aroma (which reminds me of what I imagine the inside of a pyramid to smell like), and its unique flavor. I always found it a very drinkable beer and very one-of-a-kind. I made it a point to buy a couple of bottles whenever I saw it. 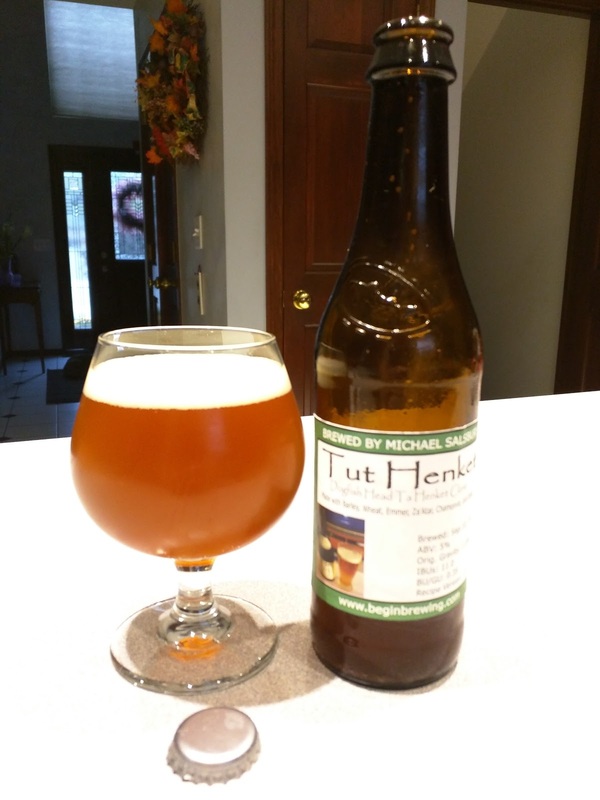 When I recently began reading Dr. Patrick McGovern's ("Dr. Pat" around Dogfish Head) book Ancient Ales: Rediscovered and Re-Created, I decided it was time to try my hand at brewing a Ta Henket clone beer. To get the most true reproduction of the beer possible, I decided to follow the recipe in the book as close to how it was written as possible. In this case, that meant brewing an extract beer (as the recipes in the book are all extract recipes). After punching the recipe into BeerSmith, something looked amiss. The book said that only 3 pounds of light DME were needed, but BeerSmith said this would produce much lower gravity beer than the book claimed it would be. BeerSmith suggested that doubling the DME amount would get me a beer closer to the gravity Griffith reported. The emmer, wheat malt, and Caramel 40L were crushed and steeped for 30 minutes in 5 gallons of water at 150F, treated with the Gypsum. The grain was removed and the water heated to boiling. While the wort was heating, I stirred in the malt extract. The Grainfather took a while to bring the wort to a boil. While I was waiting, I took a pre-boil gravity reading which was 15.5 Brix, well above the expected 12.4 final gravity. I knew I'd need to add some water to bring the gravity down to the target later. 15 minutes - Extract a cup or so of wort, and pour it over the dates. Use a blender or immersion blender to puree the dates in the wort. 10 minutes - Add the pureed date mixture to the kettle. After the 15-minute rest, pumped the wort through the counter flow chiller into the fermenter. Wort temperature in the fermenter was approximately 74F. A gravity reading in the fermenter showed a gravity of 16 Brix, well above what the recipe called for. I added cold water to the sanitized fermenter. By the time the fermenter was showing 6 gallons, it was reading 12.4 Brix on the refractometer. I sprinkled the dry yeast across the wort and sealed the fermenter. I'll need to keep an eye on it, as this didn't leave a lot of head space for high krausen. The recipe calls for the beer to ferment until it's finished and to spend 1-2 weeks in a secondary fermenter to achieve "desired clarity". I'm thinking that once the fermentation is finished, I'll pitch gelatin in it and give it a few days in the mini-fridge to clear up. Update 09/23/2017: Fermentation was vigorous for the first 3-4 days after brewing, then slowed to virtually nothing for the past few days. I've decided to bottle it as-is without gelatin finings or cold crashing, since the real Ta Henket isn't particularly clear. I'm aiming for 2.5 volumes of CO2. The beer is at about 70F and there are six gallons of it, so I'll use approximately 5.4 ounces of corn sugar dissolved in water to do it. Update 10/8/2017: The beer has completed bottle conditioning now and samples were shared with several of my friends at work on Friday. I'm awaiting feedback. It was interesting to note that for this brew, BeerSmith's estimates of gravity were way off. I'll have to keep an eye on this as I brew other beers from the book. Update 10/8/2017: The beer has a good flavor to it, and reminds me of the real Dogfish Head brew. Where it differs is in the aroma. With the S-33 yeast, the aroma is primarily the malt, spice, and chamomile. Next time, I would use a more aromatic yeast like White Labs Bastogne ale, which gives off a distinctive aroma that might be similar to the Egyptian yeast Dogfish Head uses.